After around 15 minutes of playing Battlefield: Bad Company 2, my computer completely locks up with the game's image on screen and the last second of sound constantly looping. I have to hard restart the machine to get it to come back. I'm not sure if this issue is isolated to BF:BC2 but it's the only game I've been playing recently. I've tried leaving a Source Engine game running and it didn't crash for the hour it was open so I'm guessing it's just because BF:BC2 is a more intensive game on the system. Could this be a temperature issue? I've previously played BF:BC2 on the same computer during the summer (it's winter here now) without any issues so I'm guessing this is unlikely. Perhaps faulty RAM or another component? These are my temperatures when in Windows - are they bad? I can try and get a picture of them while I've got a game running if that would help. 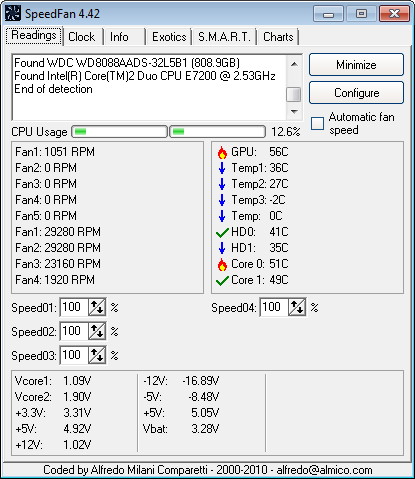 Your temps are mostly fine, maybe the CPU is a bit hot, if these are idle temperatures. Seems like it's the RAM or the CPU. GPU faults don't act up like that. So, you setup an isolated stress test for each suspect. If it passes the tests, move on to CPU. If it doesn't, find and remove the faulty RAM stick and repeat the test. It might also be that your CPU is running too hot. In that case, open your case (warranty is lost, if any) and clean the dust off from the heat sink and the fans, if any. See if the temperatures drop. If not, the heat sink might have come loose, or has not enough contact to the CPU die. You might want to re-apply the heat conducting fluid. Unplug all USB devices, with the exception of keyboard and mouse. Update Windows via Windows update. I had this issue and resolved it by disabling my motherboards onboard realetek sound and fitting a pci soundcard (Creative Labs). How can I be running out of address space on my 64-bit system? Battlefield Bad Company 2 for MAC? How do I run Facade on Windows 7?